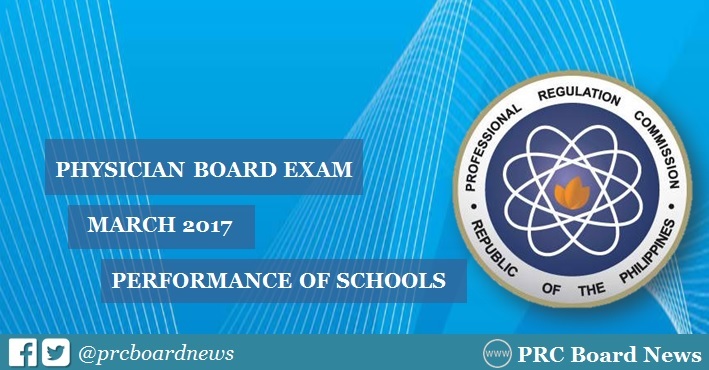 The Professional Regulation Commission (PRC) and the Board of Medicine released results of March 2017 Physician board exam on Thursday, March 16. As expected Far Eastern University (FEU) - Nicanor Reyes Medical Foundation aced the board, the only top performing school according to PRC, 88.20% or 157 out of 178 passed the exam. With this, FEU-NRMF continued its legacy of leading the Physician board exam for the past years (same period). PRC has administered the licensure exam on March 5,6, 12 and 13 in the cities of Manila, Baguio, Cebu and Zamboanga. In the same period last year, Far Eastern University (FEU) - Nicanor Reyes Medical Foundation topped the board with 80.53% or 91 out of 113 passed the exam. FEU-NRMF also led the schools in the February 2015 exams with 93.64%, 103 out of 110 passed.